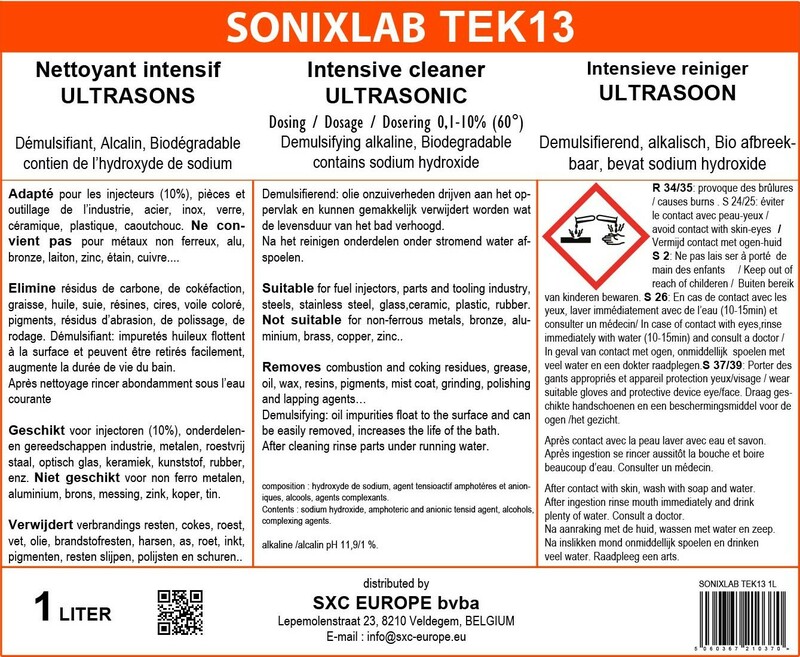 Sonixlab TEK13 has been especially designed for cleaning in ultrasonic cleaning units. Sonixlab TEK13 removes resinification, coking residues, soot, fat, oil, wax, pigments, mist coat, grinding-, polishing- and lapping-residues etc. from steel, stainless steel, precious metals, glass, ceramics, plastics, rubber etc. Designed to efficiently clean injectors from gasoline and diesel engines. 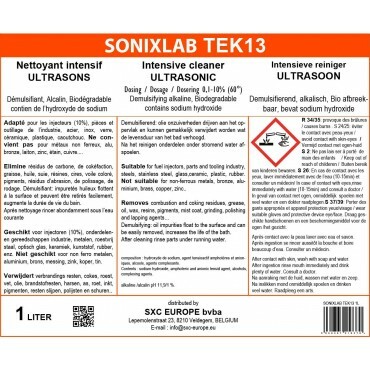 Sonixlab TEK13 cleaning solutions are demulsifying. Oil and fat containing components float to the surface of the cleaning solution so that they can be skimmed easily. The lifetime of the cleaning solution is prolonged. The effectiveness of oil separators is not impaired. Due to its strong alkaline composition, TEK13 is NOT suitable for aluminum, light metals, non ferrous metals, tin and zinc. Sonixlab TEK13 is a concentrate and should therefore be diluted, depending on the degree of contamination and the application, the manufacturer prescribes a 0.1 to 10% dilution.